The questions are often asked, "How do I know when I am ready for my first Old World tarantula"? What would be a good beginner OW tarantula? Should I purchase an adult, juvenile or spiderling OW tarantula? This web page will answer most of your questions about OW tarantulas and better help you to feel comfortable and confident with an OW tarantula. As a general rule, NW tarantulas are slower moving than OW tarantulas, with the exception of the Genus Ephepobus, Psalmopoeus. As spiderlings and juveniles, most NW tarantulas may become skittish and bolt for short distances, but the afore mentioned Genera, are extremely fast. The main defense of NW tarantulas are urticating hairs on their abdomen, that they kick in the air as a defenses mechanism to ward off a would be attacker. There are exceptions: the Genera, Ephepobus, have their urticating hairs on their pedipalps, Psalmopoeus and Tapinauchenius have no urticating hairs, the Avicularia, Pachistopelma and Iridopelma must make contact with its offender to lodge urticating hairs, as a porcupine. The second defense of NW tarantulas is to flee. Yes, NW tarantulas may make short burst of speed to avoid an enemy. The third defense is to use their fangs to bite. This is rare with most species of NW spiders, but that is what their fangs are for. This is normally after a threat pose (warning) has been given, not to touch. Most New World spider's abdomen may become very large with much feeding, so handling should be done close to the floor to prevent an accidental fall and a ruptured abdomen. The behavior of most OW tarantulas are completely different from that of most NW tarantulas. Most Old World tarantulas are fast; I mean lightning fast. My first Old World tarantula I purchased was a missed identification. I paid for a Grammostola pulchra, instead I received this. I don't know the name of this species today. I purchased her in March 2000. When I opened the vial she bolted out on the table, than she ran and jumped from the table to the floor before I could react and it was a foot race from there. She was only 1" (2.54cm) at the time. It was a wide opened space, so she had to run twelve feet (4m) to get away, good for me. Her name is Madam Speedy. She is your typical OW tarantula with the attitude and all, but has become a family favorite. Most OW tarantula's main means of defense are to expose their fangs in a threat pose and to bite. They will also raise their front pair of legs and hit the substrate as a warning. Some OW will become so angry, that they will flip on their back and expose their fangs. My Pelinobius muticus, (King Baboon) fangs will drip with venom. There is no such thing as a dry bite with this species. Some OW tarantulas may even take on a aggressive (offensive) role, by charging, which can be very threatening to some people. 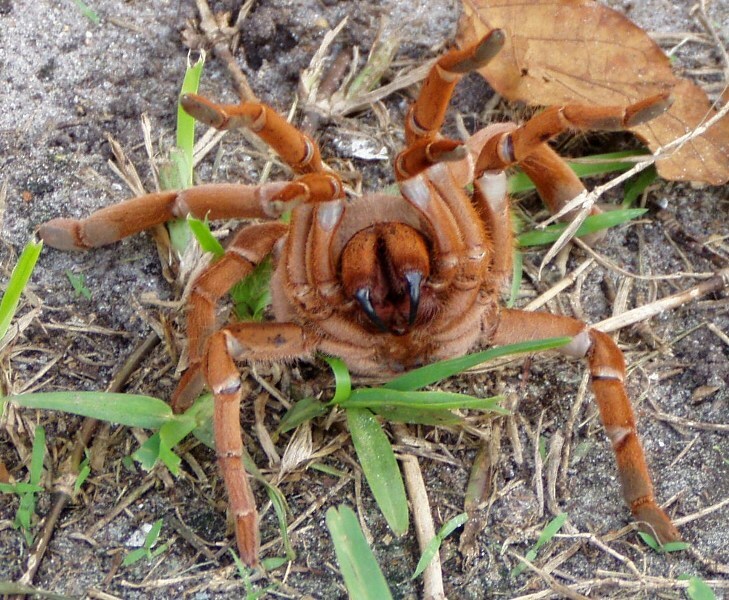 Most tarantula venom has not been tested for potency. From the bite reports that I have read, people reaction to an OW tarantula bite is more severe than a NW tarantula bite. As a general rule, it is said that OW tarantula venom is more potent than NW tarantula venom. That is good enough for me. Make sure you do your homework before you acquire an OW tarantula. This wedsite should give you enough general knowledge of OW behavior for you to make a good selection and what to expect. Get specific information on the species you are interested in purchasing from my "CARE SHEET" web page. When unpacking your newly acquired OW tarantula, be prepared for the unexpected, even in a spiderling. Unpack in an open space area, away from objects the spider can crawl into or under. Have a deli cup on hand to catch it, if it decide to bolts and a flat piece of cardboard to cup your spider, twelve inch forceps and a spoon to direct or manipulate your spider. You should have already prepared the enclosure the tarantula is to be housed in before unpacking the new addition. If the tarantula does not bolt on you, after opening the top, place the container it was shipped in, inside the terrarium the tarantula is to be housed, if the terrarium is large enough. After it has exited out of the shipping container, remove the shipping container with the forceps. I dress in a close fitted T-shirt to prevent the tarantula from running under my clothes. I had tarantulas run up my arm and under my shirt sleeve a couple times and had to have someone assist in capturing the spider. Thank God I wasn't bit! SHOULD YOU CHOOSE AN ADULT? Until you get some experience with OW tarantulas, I would suggest that you purchase a spiderling as a first Old World T. They are less threatening and most likely will only bolt from you in most cases. 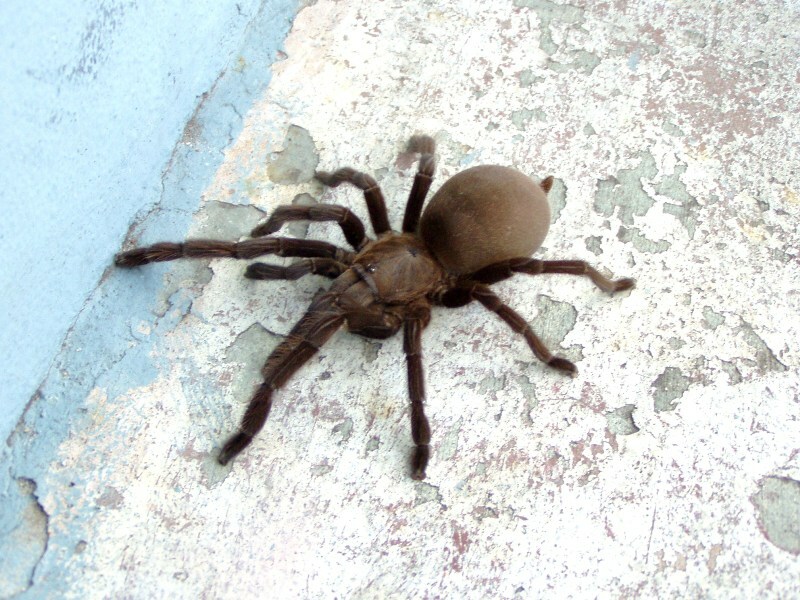 While taking an adult Old World tarantula out of the container it was shipped in, you may encounter a fang wielding, venom spewing, leg lunging, hissing (stridulating), insane and angry tarantula, that instead of running, stand its ground or even charge you. This is why most experienced keepers don't recommend OW tarantulas for the novice keepers. By getting a spiderling, you will have a tarantula that you can manage and become experienced with its behavior. Besides, you will enjoy watching your T grow up and most OW tarantulas are fast growing. In my experience, I have found that there are some NW tarantulas that can be even more difficult to work with than a OW, for example the Acanthoscurria natalensis. This tarantula is all of the above with urticating hairs; not to mention the large size it attain. One of my female, while being rehoused, was so enraged, it flipped on its back and exposed its fangs for over thirty (30) minutes. It did not bolt, so I left it alone until I was able to manage it. People have declared that the humble Grammostola rosea (Rose Hair) was not as humble as reported, but wielded their fangs like a OBT (Pterinochilus murinus) and I have seen a hobbyist play with a OBT like it was a doll, rubbing its belly. I would never try that with mine. GET TO KNOW YOUR TARANTULA and remember animals have mood swings just like you, respect it. If you are under the age of 18 yrs old, you should inform your parents that you would like to purchase a tarantula that is more defensive and get their consent. Make sure to inform and educate your family about OW tarantulas. You may want to keep the cage locked if you have young siblings or children in the house. The only time you should have to interact with an OW tarantula is during maintenance or rehousing. I use a large twelve inch 12" (30.48cm) forceps to remove boluses and molts. I mist the cage, water and feed my OW tarantulas from an opening at the top of the terrarium. Never mist your tarantula directly, that will surely startle it. To rehouse a OW, you need as much open space as possible, away from objects it can crawl into or under. Have a deli cup and a flat piece of cardboard to capture it, if it decided to flee. You should have already prepared the enclosure it is to be transferred into. If you only have one enclosure, the deli cup should have a lid to it. If you have to unearth your tarantula, once the tarantula is exposed its first reaction will probably be a threat pose. Immediately place the deli cup over the tarantula and slide the cardboard or container top under it. Then you can safely remove the tarantula. Reverse the procedure when introducing the tarantula to its new setup, but leave the container over the tarantula and use the forceps to remove the cup. I got my first OW tarantula because of a dealer error (DE). You may end up with one as a freebie. You may receive, to your surprise, an OBT as a freebie, thus thrusting you into caring for an Old World tarantula unexpectingly. What you read here, and with common sense, you will have no problem caring for an OW tarantulas. In fact, I guarantee you will start purchasing more OW spiders shortly after owning your first one. Almost all of the tarantulas I have purchased within the last two years have been OW. To me, they are more intriguing than NW. They are so diverse in their behavior, seclusive, hardy, and striking in appearance and challenging. I feel that the OW tarantulas are more misunderstood than understood. They are more defensive than aggressive. To understand this is to respect them and give them their space. 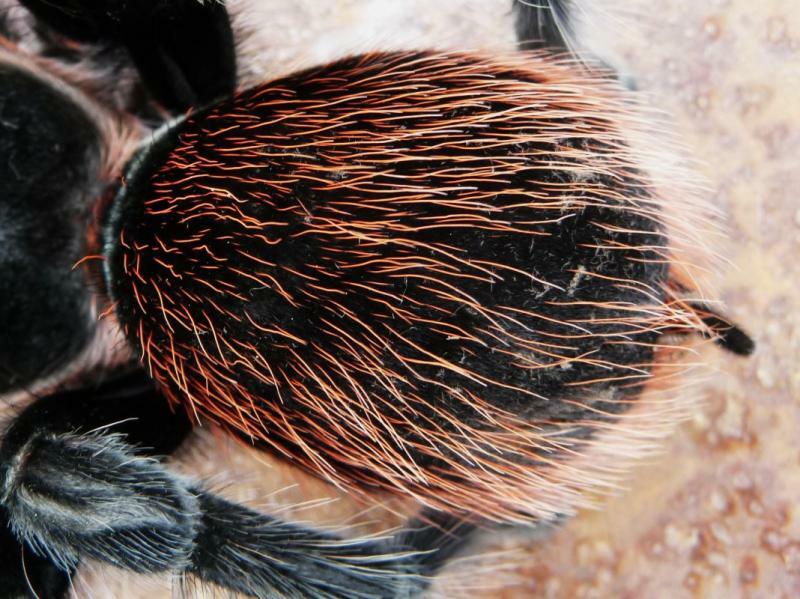 NW tarantulas use urticating hair as a defence, OW tarantulas use their fangs. Understand a threat pose as an invasion of their space when you clean out their cage or rehoused them. Most OW T's would rather beat a retreat than face you. Again there are exceptions to the rule. If your OW tarantula does go into a threat display, then just leave it alone and try again later. When you have to interact with it because of the need to rehouse it, wait until it comes out of its home before attempting to capture it, because I would be upset also if someone came and drag me out of my house. The proper setup for an Old World T is also key to a less defensive and happy spider. My experience is, when an OW tarantula doesn't have the proper setup (cork, leaves, substrate and proper hide), they become more defensive and stressed. New World T's will also become stressed and more prone to kicking urticating hairs if not properly housed. The more you are able to duplicate a tarantula natural habitat, the more you will be able to observe its normal behavior. Do your reseach by reading the care sheet for proper setup. The reason most people don't own OW tarantulas is because most are seclusive. Hobbyist liken OW tarantulas to having a pet hole, and say, "I never see my tarantula". My remedy for this is, not to gorge an OW spider. Once they become hungry, they will sit at the mouth of their burrow with their front legs sticking out, waiting for prey. They will also come out of their burrow to capture their prey and after seizes its prey, may stay out and eat it. And of course there are those special times when they will come out for hours in your presence as to say "you can take a look at me now". Those are exciting times and well worth owning an Old World tarantula. The tarantula hobby is so diversified, with species from almost every part of the world, except the frigid regions. There is a smorgasbord of OWs to choose from. From arboreal to an obligate burrower, from a trap door to opportunistic burrowers. There are the horned, stout legged, not to mentioned the dwarf and the giants that rival a T. blondi in size. There are even species that truly live communually. Any serious collector will have several OW species in his collection. I believe that every tarantula owner should experience owning at least one Old World tarantula. If you follow these steps and is confident, you are ready for your first Old World tarantula.